Despite its subject of drug trafficking, this is an unassuming film , one might even say almost 'gentle', and far from what one used to expect of Eastwood in most of his career of 'hard-man' portrayals. Whilst not particularly exceptional, it's certainly not at all bad. (Btw: I appreciate that there are those who steadfastly refuse to see any film involving Eastwood because of his well-known political stances. I manage to put that out of my mind when watching). At the start he plays the owner of a horticultural business (he specialises in lilies) which hits hard times and has to fold. Without work and income, for which he's desperate, he's told that he can make money by simply doing some driving of a delivery within Illinois. Jumping at the chance he agrees to take a small mystery cargo as required and he gets handsomely paid, assuming that it had been a one-off consignment. But he's asked to do it again - and again - his recompense increasing each time. It takes some time for him to cotton on to what his deliveries are, despite his working for youngish, male Mexicans - all Spanish-speakers, of course. Either that or he mentally blocks it out - and soon he's up to his ears in the world of contraband. Without knowing that Eastwood is involved, the police boss (Laurence Fishburn) has suspicions of something untoward going on and assigns a Senior Drug Enforcement Officer (Bradley Cooper playing quite restrained - for him - and looking hot in the way only he can!) to find out what it is and to close it down. Meanwhile the wife (Dianne Wiest) of the Eastwood character who's become distanced to her husband complains about his long absences from the family, and they have a few heart-to-heart scenes together. There's a little bit of violence, but no full-on sustained scenes, and what there is is depicted fairly low-key. Some may justifiably blanch at a brief scene when Eastwood meets the grateful instigator of the drug-traffic (Andy Garcia) and as a 'treat' spends the night with two shapely female forms, each under a quarter of his own age! Thankfully, we don't actually see any bedroom 'action'; it's all by implication. Eastwood looks and moves about as the age he is playing, so there's no complaints about that. The film's suspense derives from not knowing to what extent the Mexican drug cartel can trust him and will they decide that he is dispensable? And, of course, will the cops catch up with him and what will the result of that be? Exemplary acting throughout, just as it ought to be with such a strong cast. I wouldn't class this as a 'must-see' film but it is entertaining enough with no glaring faults or, as far as I can make out, nothing to turn one off from making the effort to try it. More than just 'satisfactory'................6.5. Another one I will look out for in the future as a lifelong Clint Eastward fan. I can assure you that it's be no means a bad film, Carol. I liked it so it can't be! This is a hard pass for me. I think Eastwood jumped the shark several years back, and not just from his talking to en empty chair moment at the RNC. Understood, Bob. I have a clutch of actors who carry just too much negative baggage around with them for me to enjoy anything they're involved with. The film has a interesting topic, but for some reason I have never been a fan of Clint Eastwood. I have never gotten though a film of his yet. I ind your last sentence a it surprising, M.M., as I think he's made very few films to which I'd give the thumbs down, though there are a few. Most of them I do find very watchable - but that's just me. Nevertheless I wouldn't be so brazen as to challenge your feelings which are themselves perfectly proper to own, of course. 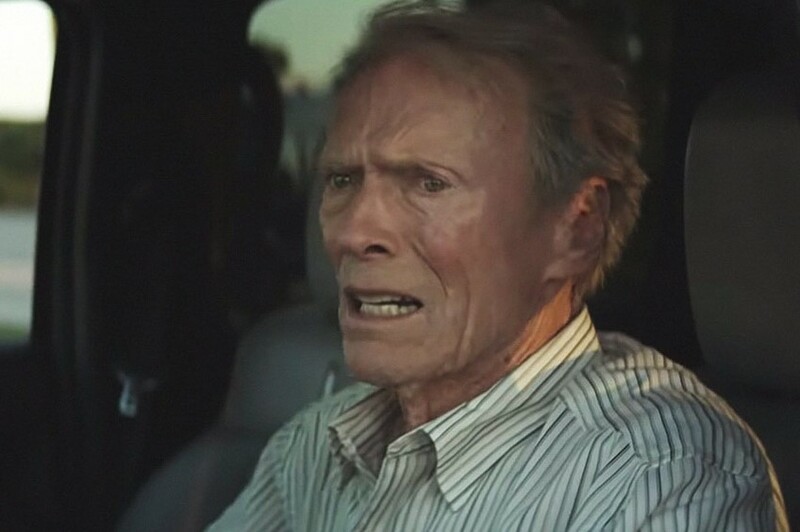 Eastwood should give up acting as much as Prince Philip should give up driving. He's made a career for the last 2.5 decades of the 'get off my lawn' crap. He looks decidedly frail and rickety in this one, B., though of course one can't be sure as to what extent that was acting. However, I don't think you'll have to wait long for his retirement, surely - either self-willed or enforced. I don't care for Mr. Eastwood; I will pass on this one. You're one of many, perhaps in the majority. I shan't attempt to convince you to watch this. 72 year-old, sensitive, gay, single (never had partner), secularist, not well-off, non-gregarious (but wish was better at socialising), vegan, animal lover, environmentally aware (and deeply concerned), news-junkie, pro-EU 'remoaner', pogonophile, n/s.